Bob- I know what your saying after seeing so many you just have a gut feeling where they should be. I was supposed to come out to WY and den with you a few years ago for a auction I won but never made it. Probably would have learned more in a few days then a lifetime of trying on my own. I regret not making it. Hope your spring denning goes well. I'll be heading west in short order to get after them as well. where/when you going? maybe we can still hook up. I`ll be in wyoming again. same o same o. it`s up in the air to leave now and get there too early, and do farm work here later, or do farm work here now and get there a tad too late. done it both ways and figure later is probably better than too early due to potential bad spring weather/storms, and pups too young yet, dens not real obvious early etc etc . no one wants to pay this year, so I`m just on a lark run. I wish we could do some denning here. I've got a hunch on one from last summer. If anyone is familiar with Atlanta and it's landmarks that patch of woods called a nature preserve at The Fernbank Museum is my guess as to the den location for the yotes I dealt with across the street at the golf course. th eastern coyotes will use a bulldose pile, broke down old deserted houses or barns, big bale piles, stacks of stumps and even big hollow trees and logs, maybe a huge tile or caved in broken field tile, sometimes just thick overhanging multiflora rose and such. in all my years never found an eastern coyote denning in a hole in the dirt or underground,a cut bank overhang at the most. and never found a western coyote not going in the ground. where is the cut off line? I don`t know, always been all the way east or all the way west, no tweener ground. I have found most of mine in a hollow root wad, pile of rocks or an old log. Redwood stumps are another popular spot. I've been itching to get out and head west and have a trip planned to ND starting next week. The dogs get crazy if they don't get hunted and it's getting time to go. I was planning on SE MT and NE WY sometime within the next month or so. If I was to call and ask the ranchers they'd say "NOW" but they don't always consider the best time to get them with dogs. 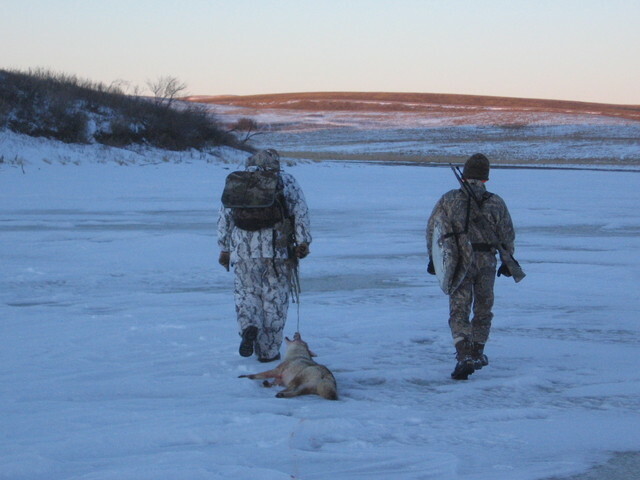 To them the best time to kill a coyote is always "NOW". Tim, and everybody else, if you ever have the opportunity to den or trap with Bob, don't pass it up. Unless you are dead in the head or on an ego trip you will learn more than you imagined. I still vividly remember my denning/trapping trip with Bob and have been trying to get back out with him ever since. I still remember the sight of pat scampering across a cliff edge hopping from rock to rock with a screaming pup in each hand. we had 6 and I says, well, grab a couple pups and head to the truckwhile get the 2 adults out that was back when we trapped the adults and pups in foot traps. now I trap the adults and use a repeating box trap of my own design in the den to get all the pups in one trip back, to save miles and time. it`s shown in my fox dvd if anyone is interested. it makes trapping pups at the den in foot traps stoneage. Bob, it's been my experience that coyote pups are a lot easier going and more gentle than fox pups. Is this true or have I just been lucky with the coyotes? lucky I guess. mine are all nasty. foxes might make more noise screaming and shrieking. the coyotes are whiners.